I highly recommend making homemade cream of mushroom soup. The mushroom is much more prominent and the cream is so light compared to the canned version. Anyone trying the homemade version for the first time will be really surprised at how delicious it is. I call this a "base" recipe. 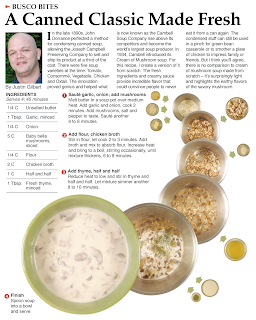 Cream of mushroom soup is used in so many other dishes, I wanted to have my own version of it. If I ever decide to document green bean casserole for example, I can refer to this recipe for the cream of mushroom ingredient. I hope to do a few more of these in the near future. My own pizza dough is a top priority for a "base" recipe. For the first time in a long time there is not an obvious joke in the introduction. 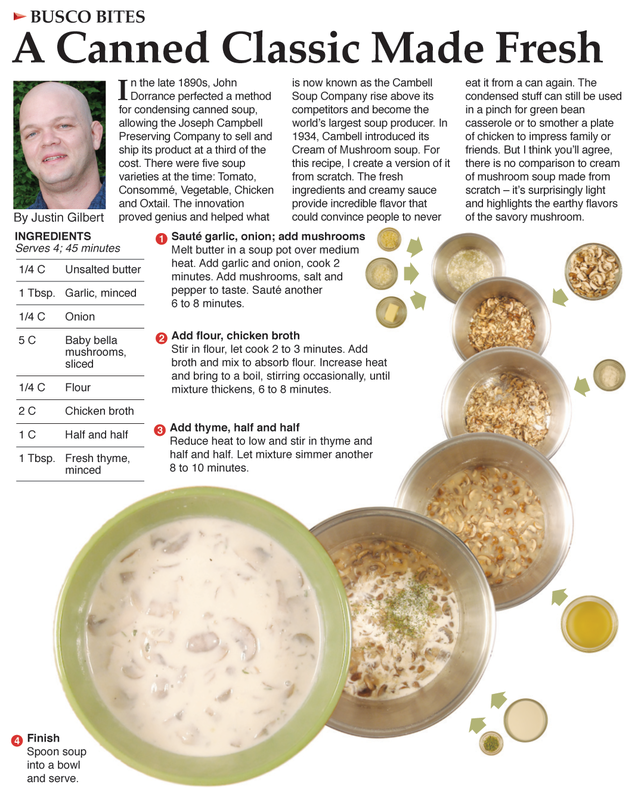 I always try to incorporate one humorous comment in every recipe, but when it came down to it, there where too many interesting things to say about cream of mushroom soup and the joke had to be omitted. I don't plan on this being the start of a trend. I love incorporating humor -- I think it helps my column stand out. The glare from the light on the soup pot gives the art in this presentation a cloudy look. Next time I use a large pot like this, I think I'm going to raise my lights so they are not so close to the actual pot. The glare is intense and it hurts the quality of the overall presentation. I am really happy with the layout. I've developed a real style for the one-pot dishes. There is a nice flow that leads you from the first stage to the final dish. 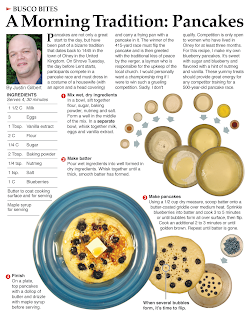 It is a familiar style of presentation for people who read the column regularly. I don't think I'll ever eat cream of mushroom from the can again. This soup was so fresh and tasty that it just blows the canned version out of the water. It has inspired me to seek out more pantry staples and recreate them for myself. It's like discovering each dish for the first time. Making dough from scratch is fun but it takes a lot of time. 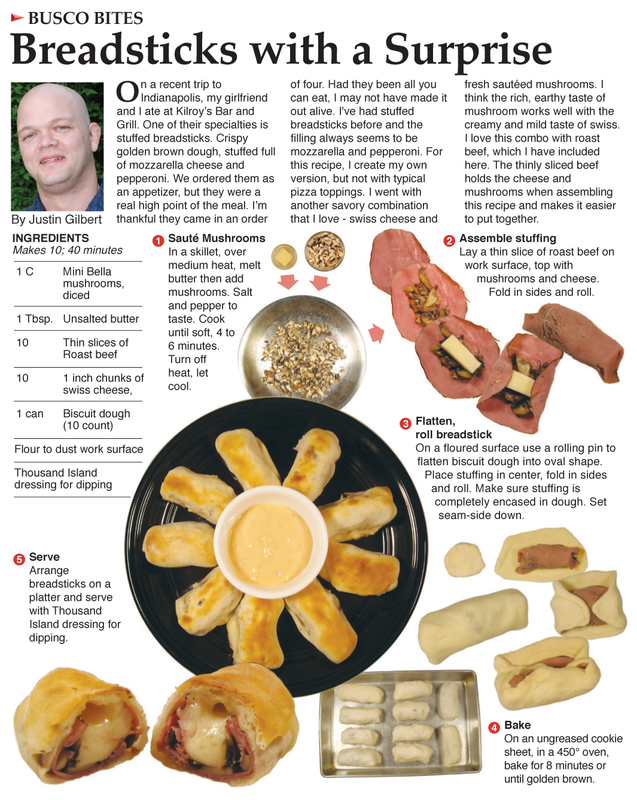 I love to take pre-made dough and use it to create something different. Whether you're using biscuit, pizza, or crescent dough, it's a way to be both quick and creative in the kitchen. This recipe is a great example of that. 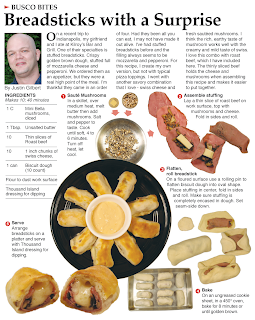 As I say in the introduction, I found that wrapping the beef around the swiss and mushroom made assembling this recipe much easier than just stacking them on the dough. The beef makes a nice barrier to keep the cheese from seeping out of the dough once it's melted and gooey. I was very happy with the overall piece. It took me 16 photographs to present this recipe. That is about as many as I can do with out it getting too crammed. The two step-by-step sequences in prepping the breadsticks are what turned this simple recipe into a complex design presentation. Be creative. Take that biscuit dough out of the fridge and get crazy. Flatten it out, roll it up. Fry it, bake it – Hell, grill it! Pre-made dough is a great canvas for making a culinary statement. 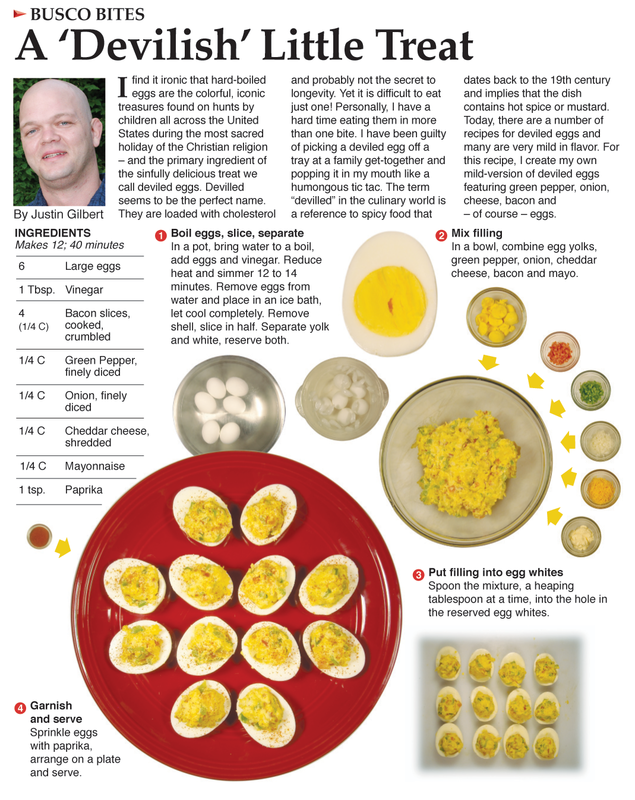 I had an interesting experience creating my deviled eggs recipe. On my first try, I put a dozen cold eggs in cold water, which took a while to come to a boil. Once they did, I turned off the heat and let them sit in the hot water with the cover on for 30 minutes. Then I shocked them in an ice bath. I completely over-cooked the eggs. They were almost impossible to peel. The thin membrane between the shell and egg stuck to the whites and I destroyed the first ten I tried to peel. By that point, I was too mad to try the remaining two eggs. They were tossed into the waste basket much like a player in the NFL spikes a football after scoring a touchdown. Thankfully, in the end, I got it right. What I came up with, after some research, is step one of the recipe. This is one of my favorite introductions. 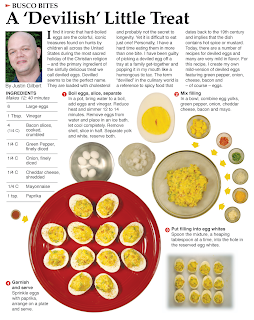 The Easter egg/deviled egg observation is a nice start and the description of eating a deviled egg like a humongous tic-tac is a guilty pleasure that some of my readers really related to. The picture in the corner of all twelve eggs before plating is a little small and some of the detail gets lost, but other than than I'm happy with the layout and visual presentation of the recipe itself. After years of gourmet cooking and many hours working to becoming a better cook, I had to learn to hardboil an egg. I really hadn't done that since the days of coloring them as a kid for Easter. A food writer learning how to boil eggs...life always finds little ways to humble us.